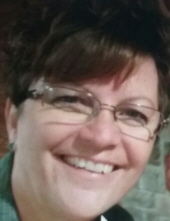 Pam Harris, 58, of rural Erie, passed away at 11:55 p.m., Tuesday, February 5, 2019 at her home. She was born on March 11, 1960 at Wichita, Kansas to Ralph Jr. and Betty (Creed) Hizey. She grew up at Wichita, Oregon, Parsons, and Erie. She attended Parsons and Erie school graduating from Erie High School in 1978. She and David Harris were united in marriage on February 24, 1979 at the Erie Federated Church. He survives of the home. Pam owned and operated the 59 diner at Hwy 59 and Hwy 47 south of Erie. She then worked as a paraprofessional at Garfield Elementary School in Parsons and at Erie schools. She currently owned and operated R and F Farm Supply with her husband. Pam enjoyed spending time and making memories with her family especially her grandchildren, camping, fishing, growing flowers, raising cattle and showing cattle particularly registered limousines, shooting clay pigeons, and helping out with the 4-H community. She was a faithful member of the First Baptist Church in Erie, Zumba for life, she participated in the American Cancer Relay For Life Team raising funds for cancer patients and cancer research, and a member of the Cancer Fighters Team at the Cancer Treatment Centers of America. Pam is survived by her husband, David Harris of the home; her son, Tony Harris, and his fiancé, Tonya Wiles of Erie; her daughter, Tonya Fowler, and her husband, Jeff of Chanute; her grandchildren, Cody Fowler, Cheyenne Fowler, Aiden Wiles, and Carter Wiles; her step-granddaughter, Kayla Lockett, and her husband, Austin of Springfield, MO; her step-great-grandson, Connor Lockett of Springfield, MO; two brothers, Rod Hizey, and his wife, Christine of Parsons and Ray Hizey, and his wife, Martha of Erie; her Sister Tina Steele, and her husband, Kevin of Marion, KS; several nieces and nephews. She was preceded in death by her parents and a brother, Randy Hizey. Funeral services will be held at 2 p.m., Monday, February 11, 2019 at the Temple Baptist Church in Erie with Pastor Danny Flippo officiating. Burial will follow in the Mt. Hope Cemetery at Galesburg with Pastor Mark Demas officiating the committal services. The family will receive friends from 2 to 4 Sunday afternoon at the Pierce-Carson-Wall Funeral Home in Erie. Memorials are suggested to the Galesburg Relief Fund, St. Jude Children’s Research Hospital, or to Shriners Hospitals for Children and these may be left or mailed to the funeral home 113 S. Main St. P.O. Box 182 Erie, KS 66733. Online condolences may be left at www.wallfuneralservices.com. To send flowers or a remembrance gift to the family of Pam Harris, please visit our Tribute Store. The family will receive friends from 2 to 4 Sunday afternoon at the Pierce-Carson-Wall Funeral Home in Erie. Funeral services will be held at 2 p.m., Monday, February 11, 2019 at the Temple Baptist Church in Erie with Pastor Danny Flippo officiating. Burial will follow in the Mt. Hope Cemetery at Galesburg with Pastor Mark Demas officiating the committal services. "Email Address" would like to share the life celebration of Pam Harris. Click on the "link" to go to share a favorite memory or leave a condolence message for the family.